Determining an antique chair's value is often difficult and may take some detective work on your part. Look at the joints - Different types of joinery were used during different time periods. The article Common Sense Antiques by Fred Taylor, author of How to be a Furniture Detective and the video Identification of Older and Antique Furniture, contains a comprehensive explanation of the different types of furniture joints and antique joint construction. Look for saw marks - Straight saw marks generally indicate that piece was made before 1800. Circular saw marks indicate the piece was made after 1800. 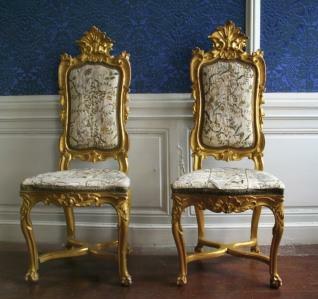 If you know the period style of the antique chair, check price guides for chairs of that specific period. There are several different monetary values attached to each antique and collectible. An antique chair's retail value is the price it would sell for at an antique shop. This is known as the secondary market value. The wholesale value of an antique is the price an antique dealer pays for the piece. This is typically thirty to fifty percent less than the retail price of the antique when it is sold in an antique shop or other secondary market venue. The fair market value of an antique chair is the price that both the seller and the buyer agree upon. Both the seller and the buyer need to be aware of all of the relevant facts and information concerning the chair and neither party must be under pressure to close the sale. The auction value, also known as the open market value or open market price, is the price that the antique would usually sell for if there is no forced sale position for the buyer or seller. The insurance value of an antique is typically the highest retail price of the piece. It is the replacement cost of the piece if it were stolen or destroyed. The tax value, also called the estate value, is determined by taking an average of the prices realized at auction of items that are the same, or as similar as possible, to the piece being valued. This value is determined by the Internal Revenue Service. If you know the kind of antique chair you have, a great way to find its current value is finding a similar chairs at an online auction or antique shop. You want to find the final selling price of the online chairs. At auction websites such as eBay, click on the "completed auctions" link on the side of the page. If you use an online antique shop for a comparison price valuation, it must be the price of a chair that has already sold. Although finding an antique chair's value may take some detective work, solving the mystery is part of the fun.